Well, it's really just minor stuff. Nothing so grand as a kitchen remodel, or a new roof. 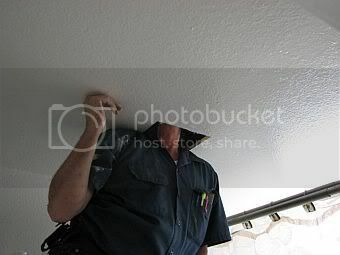 But we got some new things installed in the ceilings! 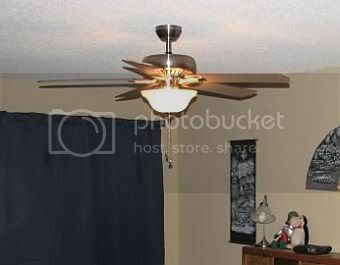 Installation of this fan also came with explicit instructions from me that a) the remote NOT be installed on the wall next to the light switch (so ugly), and b) that the light switch only operate this ceiling fan. What that second part means is previously the light switch operated an outlet on the wall, and if we were getting this central light fixture I wanted the outlet to be always hot, and the light switch to only operate the fan. I am so happy I got an extra outlet back, I can't even tell you. Second project: New bathroom fans. Ok, this one involves a story. Ever since we moved in splorp! has had a love-hate relationship with our master bathroom. He is 6 foot 2 inches, and as a tall guy he loves the fact that the shower already has a very tall showerhead connector, and he didn't need to put any adjusters on it to make it taller so he could actually fit his head under it. By the way, have you seen these extension arms? They're really very cool, and easy to install. We had one on our shower in the last apartment, and he loved it. I think he said it was the first time since he hit his growth spurt in puberty that he could actually stand under the shower and the water hit the top of his head without him leaning backwards to do it. Anyway, so splorp! loves the shower, and loves the fact that our master bathroom is actually attached to our bedroom (en suite, I think it's called), and he loves the fact that (unlike our last apartment) it is fully enclosed by walls instead of having the sink out in the middle of our living space. But he is not too fond of the ventilation system in the bathroom. 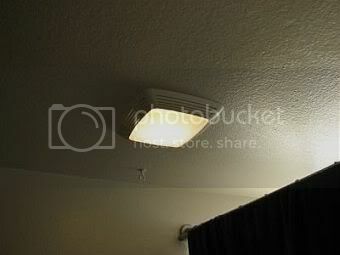 Specifically, the lack of ventilation system because the bathroom has a window. A window that is inside the shower. Now, I understand the concept. You need to let the steam out of the bathroom to prevent mold and mildew, so you either need a bathroom fan (usually in an interior bathroom) or you need a window. But I have always hated the windows that are in the shower with you. I mean, in summer it's not too bad, but in winter? In winter it's just cold air coming down on top of you because guess what - hot air rises and cold air falls. And when the window is in the shower with you, the cold air falls right on top of your wet body. So splorp! wanted a bathroom fan, even though the bathroom is already "adequately vented" with the window (such crap - the bathroom is still steamy, even with the window open). Ok, if he wanted it that badly, he's going to get it. But I asked him if he's going to do this to please either replace the bathroom fan in the hall bath (an interior bathroom, but the fan was deafening - it sounded like a jet engine) or put an additional switch in the hall bathroom that controlled just the fan, so I could turn on just the fan or just the light. And that is how splorp! and my dad spent their weekend. 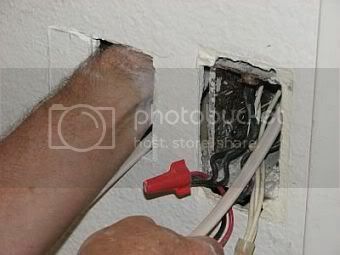 Dad (being smaller and also knowing more about electrical stuff) did most of the crawling in the attic and running wires. splorp! did most of the going up and down ladders and handing stuff around. Now we happily have 2 new bathroom fans (one which is MUCH quieter than the piece of junk that was previously there), plus a lovely new ceiling fan. Next up: hopefully can lights in the kitchen, but I'll settle for track lighting. I'm also not sure when this will happen as it is getting extremely hot in the attic area. Oh LadyCiani, you are such a good storyteller. What a hoot!